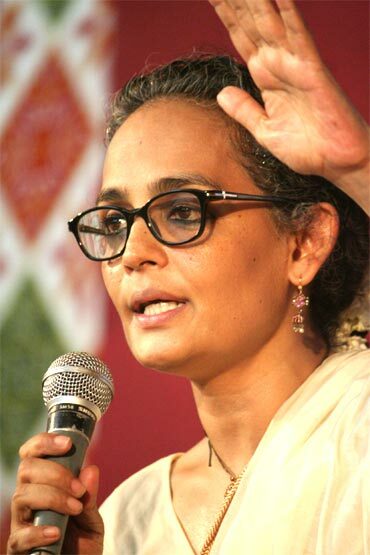 Activist Arundhati Roy spoke on 'War of People' at the Mumbai Marathi Patrakar Sangh in Mumbai on Wednesday. Below is the transcript of the talk. "I think we should reverse the way we see this issue (war against Naxalism) and the way it is being put to us. But the fact is nobody needs this war more than this government. The fact is it is manufacturing an enemy to justify its war. When the PM said Maoists are the greatest internal threat to the country for the first time in 2004, what was the situation? What is that makes it so urgent for the government to fight this war? In 2005, a huge number of MoUs were signed by the biggest corporations in the world, and they have been waiting. If you read the business papers you will understand clearly which MNC is waiting for which land. All these infrastructure projects, the first thing they do is relocate the poor people. I am not here to defend the killing of innocent people by anybody, not by the Communist Party of India-Marxist, the Maoists or the government. That is not my brief. When the 76 CRPF personnel were killed, there was this tremendous pressure on me, saying you went inside, you romanticised violence, now come and condemn this violence. BUt I ask what were the CRPF people - she lists an array of heavy arms -- doing there? This is the war between the poorest people of the world, against the biggest democracy in the world. And they are winning. They have stopped the corporates on their tracks. They are asking a serious question. This is questioning the meaning of democracy, of civilisation itself. These are not questions that are coming from art galleries -- they are coming from the millions of people who have put their lives on the line to ask this question. The answers are the key to what is going to become of this planet, this civilisation, the human race. When Capitalism won against the Afghans in the 1980s, the whole world did a somersault, including India. We became natural allies of the US and Israel, and then digressed to condemn the attack on the flotilla. When i wrote 'Walking with the Comrades', I was happy when I was criticised of romanticising because I believed in the romance of the forests, the romance of the people. We love romance... we like the romanticism of violence in our movies, as long an airhead with biceps and machine gun is doing it. But, when the violence of the poor people is romanticised, we don't like it. In the Dandakaranya, where I walked with the comrades, 640 villages were emptied. Many of them live in Andhra, many live in the forests. The same things -- same violence, same terror, same allignment of forces -- happened during the Telangana movement of the 50s and 60s. Pakistan, which was never allowed to have a democracy thanks to the US, is craving for a democracy, while India, a democracy is fighting for a military state. The media, the middle class is begging for a military state, she says. When a journalist asked her if she supported violence, she said, "In human nature, there is always violence, and there is always love. When we decide to be violent and when we decide to love is up to the individual. Today people like me are totally on the side of the resistance; because we think the question the tribals are asking -- whether the bauxite can be left in the mountains -- is correct. The adivasis are not fighting for state capitalism, they are fighting for the bauxite to be left in the mountains. They are saying we don't want advanced weapons, aircraft, etc. Mining bauxite gives alumina, which consumes a lot of water. They have a revolutionary armed resistance but they do not have a revolutionary vision. A rock hard resistance, which is elastic and takes in dissent and argument, will make it stronger. But we need to understand we can't betray the causes we are fighting for. All across South Asia, what are the areas under attack? All of them are under assault by a marauding capitalist system. In Afghanistan, the resistance is taking the form of radical Islam; in India, it is communist extremism -- but the assaulting force is capitalist everywhere." You must talk about these issues because your life will be affected too at the end of it." Roy then takes questions from the audience. A questioner says he shared every emotion expressed today, but what can we do until human nature changes? Roy: We shouldn't conclude that human nature is greedy. IT is also sensible. The most successful secessionist movement in this country is the secession of the middle and upper class in this country. They are sitting there and saying 'What is our bauxite doing in their mountains, what is our water doing in their rivers, they ask from up there'. A questioner, who introduces himself as a student of Indian economics, says India is the most oppressive society and a revolution is required, but the Maoists are not the revolutionaries who are needed right now. He says it was wrong of Roy to support them. Roy: What is going in the Congress is an old game, where Sonia and Rahul are playing the good guys, and Chidambaram and Manmohan are the bad guys. Rahul Gandhi goes to Dantewada, but doesn't say a word about Salwa Judum (an uprising of local indigenous people in Chhattisgarh to fight Naxalites), which was run by a Congress leader and supported by the BJP government.